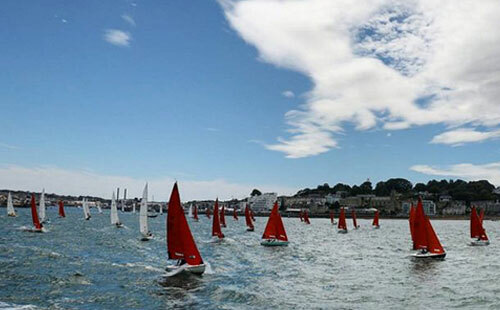 Charter a Jet to Cowes Week to watch 1000 boats race over 8 days. Imagine the majestic sight of sailing yachts, some more than 70 feet long, cutting through the waters in a race in the Solent, a waterway of tricky double tides between southern England and the Isle of Wight. Now, imagine all the history behind this oldest and foremost sailing regatta in the world, which has been run every August – except during the two world wars – since 1926. It’s Cowes Week, a thrilling event that draws more than 100,000 people to watch 8,500 sailors from all over the world race in 1,000 boats over eight days. Traditionally, the race had always been held the week before the Glorious Twelfth, the first day of grouse hunting season, but now fluctuates to take advantage of the tides. If you’re interested in seeing some 40 races a day off the picturesque coast of England, Paramount Business Jets can arrange a flight to take you there. There are no bridges across the Solent strait. The Isle of Wight is accessible only by ferry – or small plane. Booking early has many advantages. 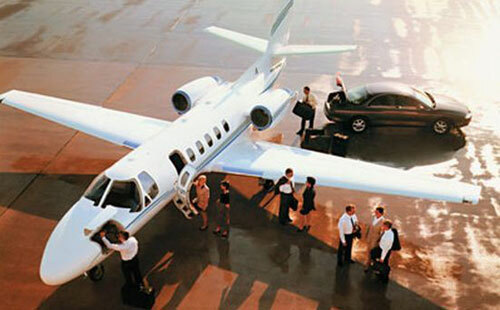 Enter a few details below to start planning your private jet flight to the Cowes Week. Cowes Harbour during Cowes Week 2007. Picture Source. There is much to see in the area when the boats are done racing. The Isle of Wight, which is 24 miles wide and 12 miles long, is separated from the mainland by the Solent, a strait ranging from one to four miles wide. If you don’t fly into one of the Isle’s small airports, it takes about an hour to get there on a ferry. Explore some 165 miles of bridleways and 500 miles of footpaths on foot, horseback or bicycle. Romp in the surf along miles of sandy beaches. Go fossil hunting. You can see dinosaur bones and footprints in the rocks along the beaches, especially near the bays. Because of this, the Isle is often called Dinosaur Island. 30 million-year-old bones of crocodiles, turtles, mammals and shellfish have been found along the northern coast. Look for wildlife like a dormouse or a rare bat and natural wonders like St. Boniface Down, the highest point (800 feet) on the island. Visit Osborne House, the castle built by Queen Victoria in 1845. Check out Carisbrooke Castle, which was home to Charles I before his execution. Take an architectural tour of historic churches, medieval buildings and ancient ruins. See Roman archaeology, coins, pottery and tools in Brading Roman Villa. Down a glass of Nyetimber English sparkling wine, the traditional drink quaffed in celebration of a race. One last thing: take a sweater. The Isle is located on the 50 degree north latitude (roughly the same as Vancouver, British Columbia; Prague, Czechoslovakia; and Brussels, Belgium) where, in August, the average high temperature is 70 degrees F and the average low is 57.